Exclusive 12, 8, 5 or 3 Easy Payments ⚡ Electro Voice Evolve 50 Portable Powered Column Line Array System only at AMS! Free 2 Day Shipping ⚡ Free Extended Warranty ⚡ Call our Gear Experts at 800-319-9043 for expert advice! Lightweight, powerful, portable, and delivering on Electro-Voice’s 80-year reputation for superior sound and manufacturing quality, we present to you the pinnacle of column speaker design - the Electro-Voice EVOLVE 50. 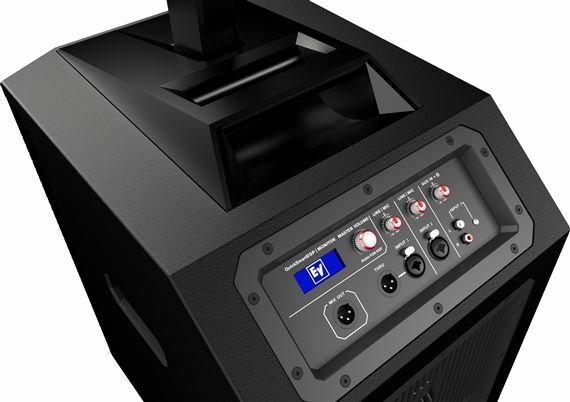 This compact and highly-versatile pro audio system packs a 1,000 watt punch into an ultra-sleek package, making it the perfect choice for solo performers, combo acts, DJs, and nearly any other mobile sound application. EV QuickSmart Mobile application: quickly and wirelessly configure, control, and monitor up to six EVOLVE 50 systems simultaneously, and receive immediate notification during critical performance conditions. Bluetooth® connectivity is available. High-quality Bluetooth® audio streaming for background music or musical accompaniment. Bluetooth® connectivity is available. 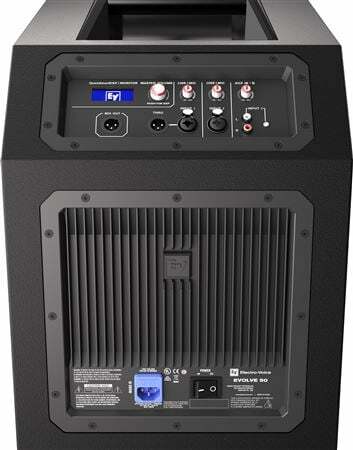 The Electro-Voice EVOLVE 50 employs eight 3.5-inch full-range drivers and a 12-inch subwoofer, powered by a lightweight and efficient 1000 watt D-Class amplifier that provides 500 watts for the sub and 500 watts for the column array. This enables EVOLVE 50 to fill small and mid-sized venues with rich, clear audio while taking up a minimum of space in your performance area. Ultra-wide horizontal coverage of 120° and array-formed vertical dispersion of 40° is achieved via custom waveguides, resulting in exceptional clarity for your audience from left to right, front to back. There is no bad seat in the house with EVOLVE 50! Have you ever wished you could transport your entire PA system to and from the stage in just one trip? 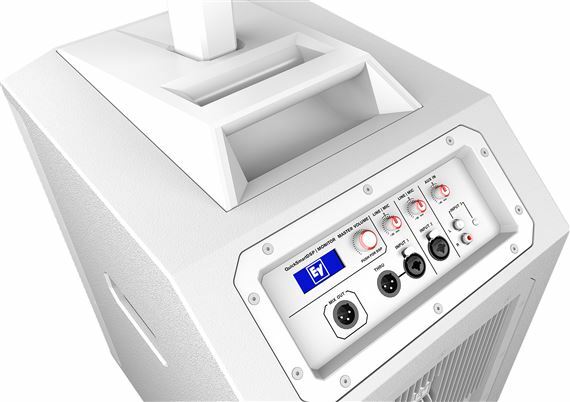 Well, your dream has just become reality thanks to EVOLVE 50’s ergonomic 3-handle design on the subwoofer and the included carry case for the sub pole and column array. 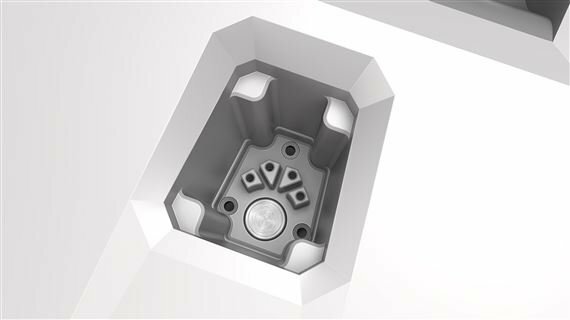 Assembly is also accomplished quickly and cleanly via the symmetrical aluminum subwoofer pole with integrated wire harness and connector. And there’s no need to worry about stability, because EVOLVE 50’s sub pole is magnetically locked in place by EV’s proprietary magnetic-assisted latching system. EVOLVE 50’s angled user interface panel on the subwoofer provides easy access for patching in and making tonal adjustments. Here you’ll find two discrete Line/Mic Inputs on combination XLR/Balanced ¼” TRS jacks, each with their own level control. Input 1 has a convenient XLR Thru jack for passing its signal directly out to another destination. Input 3 incorporates a Bluetooth® receiver for convenient wireless streaming of audio from any mobile device. It also has its own level control and features a pair of stereo RCA jacks and a 3.5mm jack for directly connecting an iPod, laptop audio feed, CD/DVD player, or just about any other consumer audio product. Finally, there’s a Master Volume control for adjusting total system level, and a Mix Out on XLR jack that carries the line-level output of EVOLVE 50’s mixer to an external amplifier, powered speaker or recording device. 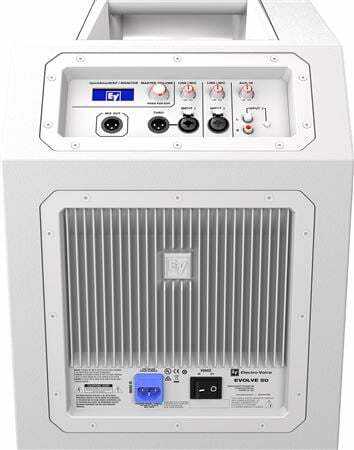 Setup of the EVOLVE 50 for specific applications is easy, thanks to EV's industry-leading QuickSmartDSP interface. Simply push and turn the dual-function Master Vol control to view your options via the large LCD screen. You can select from four tonal presets (Music, Live, Speech, Club) to get a head start on your sound, then fine-tune by adjusting the 3-band EQ. Store and recall your settings via five user-programmable presets to make the next gig even easier. Limiter status is also easily viewable on the LCD. Want to control EVOLVE 50 from front-of-house using your iPad or smartphone? No problem. Need to quickly configure up to six QuickSmartDSP-equipped loudspeakers simultaneously? Done. You’ll even receive immediate notification in the improbable event that your system experiences critical performance issues. Love everything about it ..
I’m so glad I finally bought this! After months of reading reviews and listening to various line array systems, I’ve concluded, Evolve 50 is the best overall value! Was better than I even thought it might have been. We are a 4-person Quartet & it is clear as a bell. this is a great product, I use it 3 time a week in church and the sound is incredible!!! Everyone loves the sound it’s easy to set up and very light the highs are clear and just enough bass to complete the live sound. High-Tech Powerful Magic - You'll love this system. The Evolve 50 is excellent and amazing. I tested it, at the same time, against practically every contender, same audio sources, along with 2 discerning, respected, and brutally honest musician/techs. Of course each system has it's strong points, but the bottom line is that the Evolve 50 covered every base they did, with power to spare. I've used it loud and soft, large and small, in indoor and outdoor environments, and it's always amazed myself and the audience. Tech Magic. EV's Evolve technology is powerful, articulate, smooth, and musical. The simplicity is there too - it's easy to setup, soundcheck, and be ready to go. In the end it's the magic that counts, and the Evolve 50 delivers. This was the best purchase that i've made with your company to date!! I love this thing and it's well the money!! This is the best all in one system around and EV out did themselves with this product! !